The question was closed at 11:57:57 (according to the hover-over-"x-mins-ago" bar) and the answer was posted at 12:16:35. It's a fairly lengthy answer, so it's possible that it was started to be written before it was closed but I swear I've started to answer a question then I got a banner along the top saying "this question has been closed" and the answer was no longer post-able. If a question is closed while you're answering on the full version of the site, you will receive a notification that the question was closed and the 'Post Your Answer' button will be disabled. However, this is only a client-side restriction, so it is possible in some cases that this process fails. When it does, the backend allows for a grace period of around four hours (previously there was no time limit). Presumably the client-side restriction did fail in this case, and since the answer was "in-flight", as Jeff describes it, the server accepted it despite the question already having been closed. For users answering from a mobile device, there's no client-side restriction in place to begin with, so this situation is presumably even easier to create when using the mobile version of the site. When a question is closed, the server still accepts answers for 4 hours. So if you can submit an answer to the question within this 4 hours, your answer gets legitimately accepted by the server. Open another question on the same site and compose your answer. 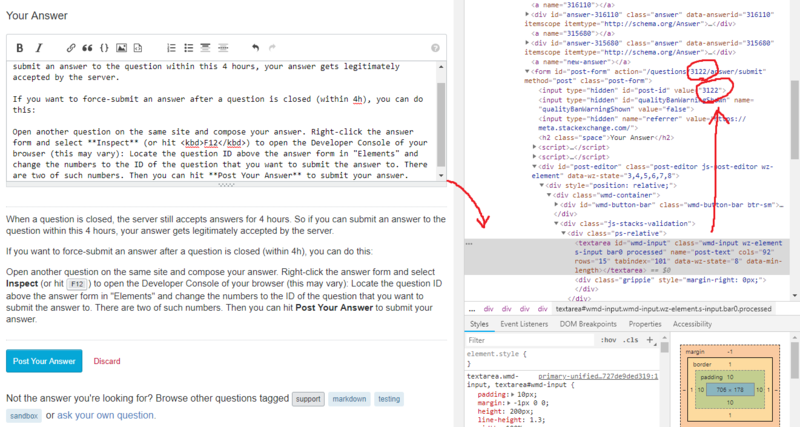 Right-click the answer form and select Inspect (or hit F12) to open the Developer Console of your browser (this may vary): Locate the question ID above the answer form in "Elements" and change the numbers to the ID of the question that you want to submit the answer to. There are two of such numbers. Then you can hit Post Your Answer to submit your answer. You will also be redirected to the target question after the automatic refresh after submitting your answer. How did this duplicate question manage to be answered after being marked as duplicate? I posted an answer after a question was closed? How was an answer posted on a closed question? Is it possible to be alerted, while answering, that the question was removed or closed? Priority Queue in .Net - Why was this question closed?